You may be abused and have black and blue bruises. You may be doing the punching to yourself. Yes, the world may have a part in it, but you are the one listening to them. You look around you to see who is watching you? And when you know who it is, do you tend to change the way you do things? You want to impress a guy you like, but you may want to piss off a girl you don’t like. No matter who it is we do alter our actions according to how we want others to think of us. You want to be a perfectionist at whatever you attempt to do. When you try to be perfect, it wears you down. Let’s take a look at perfectionism. To be a perfect person you continually improve something until it is faultless or as faultless as possible. Over and over in your mind, you play out a situation until you believe it is near perfect. Then you take that case and revamp it so you can improve on it some more. If you are in school, you take your final only to find that you made a 98%. 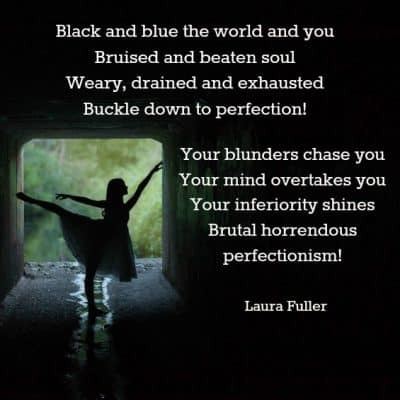 Because you are a perfectionist that is not good enough. You have set your standards, and you have to do 100%. In your mind, you beat yourself up until you are black and blue and bruised. You lose sleep over this imperfect score until you are weary, drained and exhausted. When you don’t have anything left inside of you is when you decide you have to buckle down to do better. You begin to make excuses for the lower than standard work you are doing. But you are the one who set these levels you have to follow. When you think someone else is judging you for the blunders, you put yourself down. You want others to know that you believe you can do better. You made 98%, and you are bothered by this. When you are talking to a classmate, you tell them that you could have done better, but you read the question wrong. You knew the answer if you had only paid closer attention. This statement may be true but give yourself a break! To make a 98% on an economics final is a dream come true for most students. You are making yourself feel inferior when others are looking at you with pride. Don’t put yourself down! Don’t beat yourself up! Allow yourself room for mistakes. Take each error with grace and see how you can improve on it. I know others are not looking at you as inferior. If there is one person in the crowd, who are looking at you that way, then they are the minority and can be called the bully in the room. Decrease your stress by believing you are not perfect and never will be. You can improve, but you cannot achieve perfection. The world accepts you this way, and it is crucial for you to do the same. Did You Wish Today Away?